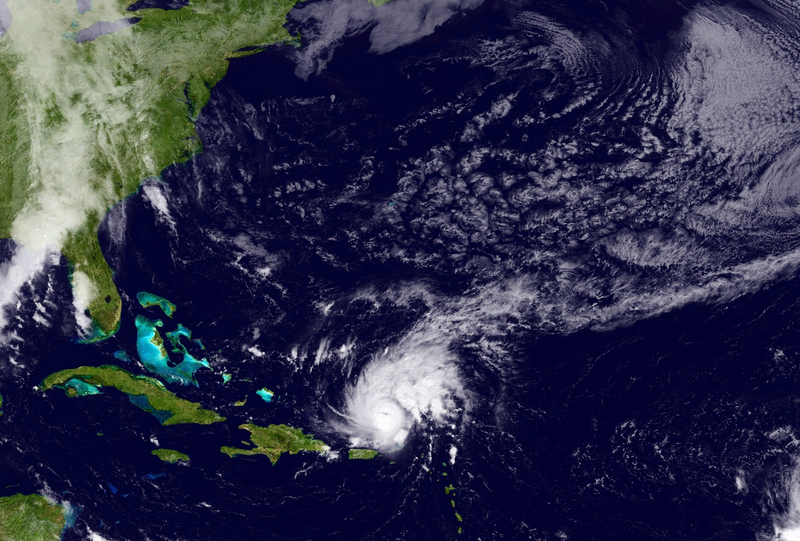 With the rise and fall of Danny, the 2015 Atlantic hurricane season is officially under way. Though tropical-storm-turned-Category-3-hurricane Danny rocked the Caribbean with its "wall of wind shear," it fizzled out before reaching the U.S. Now meteorologists have their sights on a new tropical storm that's now moving west and growing in strength. It's currently approaching the Leeward Islands and expected to move over Puerto Rico and the Virgin Islands later this week, but will Tropical Storm Erika hit the U.S.? As of now, according to meteorologists, it's still too early to say. After forming late Monday night in the central Atlantic Ocean, Erika began its trajectory towards the Leeward Islands in the West Indies, where tropical storm watches are in effect throughout Tuesday and could last through late Wednesday or early Thursday. Meteorologists predict that Erika will then make her way toward Puerto Rico and the Virgin Islands later this week, when it is forecast to be upgraded to a Category 1 hurricane with winds of up to 80 mph. While it's too early to say with much certainty, some models have projected a possible trajectory into the Bahamas and the Southeast U.S. coast this weekend or next week. Erika could come as close as within 200 miles of South Florida on Sunday. Does this mean Florida residents should start preparing now? Not necessarily. Tropical storm and hurricane paths often shift and they can weaken before expected. As of Tuesday morning, Erika was still hundreds of miles east of the Leeward Islands with maximum sustained winds of around 45 mph, but it's in favorable conditions to grow in strength — warm waters with low wind shear. Before it's forecast to become a hurricane, however, Tropical Storm Erika expected to drench several Caribbean islands in the next few nights. If you happen to live or are vacationing on Antigua, Barbuda, Montserrat, St. Kitts, St. Maarten, Guadeloupe, or a nearby island, you might be holing up and watching marathon episodes of Parks and Rec on Netflix on Wednesday — or a candlelit book marathon if the power goes out. As for U.S. residents, there's no need to panic yet. And even if Erika does maintain her hurricane strength and slam into Florida, you probably would have been at home watching Netflix anyway. All jokes aside, if you live in one of the areas in Erika's projected path, keep your eye on her development so you can properly prepare.